South Africa has a long and proud history of championing the rights and the humanity of workers. It is a history that has been embedded in the psyche of young South Africans in all corners of the country. It is a legacy that students hope to continue. By DYLAN BARRY. On Friday the 23rd of October, after students shut down institutions of higher learning across the country, and thousands of students marched on the Union Buildings in protest against the increasing costs of tertiary education, President Jacob Zuma announced that there would be no increase in tuition fees for the year 2016. This was a victory for students, and for many of those viewing the shutdown and protests from outside of our tertiary institutions, it appeared to be the victory. However, on Monday the 26th, the University of the Witwatersrand (Wits) remained shut down by students. The University of Cape Town (UCT), remained shut-down by students. The shut-down and protest action continued at institutions across the country. The reasons vary across institutions, but for the most part, what kept, and continues to keep students protesting, is an issue that is almost universal at our universities, the outsourcing of workers. Outsourcing is the process of contracting workers through private companies, instead of employing those workers directly. At Wits, outsourcing began in earnest in 2000, when, under the leadership of then Vice-Chancellor, Colin Bundy, outsourced most of the university’s labour needs to private companies, including grounds work, cleaning, and maintenance. For those not familiar with the issue it might not be immediately obvious why this would be such a bad thing, but it is the nature of outsourcing that has had students, workers and academics working to reverse it for the last 15 years. In 2000, according to the Wits Workers’ Solidarity Committee’s 2011 report to the university senate, the process of outsourcing led to the retrenchment of 613 workers, less than half of whom were reemployed by the private companies that took over. Workers’ conditions and pay suffered significantly. For example, the wages of cleaners fell from R2,227 to about R1,200. Workers lost benefits, including medical aid. They also lost pensions. But perhaps most importantly, workers lost free education at the institution for their children. Outsourcing has also made it much more difficult for workers to find representation and organization in trade unions. National Education, Health and Allied Workers’ Union membership at Wits was roughly halved by outsourcing. The specifics differ from university to university, but the theme is the same. Outsourcing has allowed for the systemic exploitation of workers at our universities, while absolving those institutions of responsibility for that very exploitation. As stated in the Workers’ Solidarity Committee’s 2011 report, outsourcing at Wits has led to a situation where workers are paid very little, and have very few benefits. Workers get no travel allowances, nor maternity benefits. Workers also receive no pension. By Wits policy they are not allowed to meet on campus to discuss their grievances, and unionisation is made very difficult. That has been an unacceptable state of affairs, and that is why students and academics, alike, have refused to let workers be left behind in a struggle that has otherwise found tremendous success. Students and workers marched together in solidarity. On the 6th of October, thousands of students, workers and academics across the country, notably at Wits, UCT, and the University of Johannesburg (UJ) protested together in solidarity against outsourcing. At Wits hundreds of students and workers marched together to deliver a memorandum to the university management. That memorandum included a workers charter, and a demand to end outsourcing. Students and workers at UJ did the same; they marched together in solidarity. On the 14th of October, a week after the outsourcing protests, students at Wits shut their university down in protest against the proposed fee increase for 2016. Workers risked their jobs to stand with the same students who had stood with them a week before. It is a factor that has been overlooked in almost every analysis of the issue, but it should not be underestimated how much momentum the student fee protests gained from the outsourcing protests the week before. Quickly the shutdown spread across the country, and the rest is history. 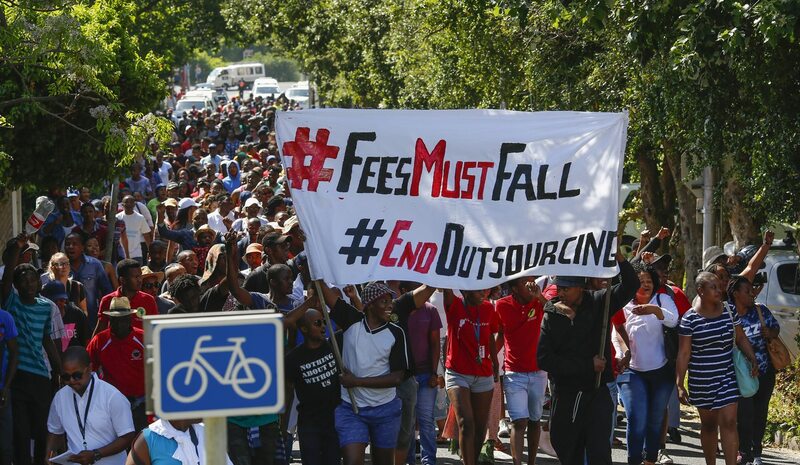 In consequence, when President Zuma announced that there would be no fee increase for 2016, but made no mention of the issue of outsourcing, most students felt that the struggle was not over. Students had achieved their main goal, but the workers who had risked their livelihoods in support, had won nothing. A victory only for students felt, and still feels hollow. Subsequently, due to pressure from students, and continued protest action, both Wits and UCT students have managed to successfully obtain commitments on the issue of outsourcing from their respective managements. This is a victory for those institutions, but unfortunately universities around the country continue to struggle with the issue. The battle may have been won, but the war is not over.